Hey Fangirls, an absolutely lovely thing happened last weekend, where Black Widow took over. At least, that was the goal. Women across the country on June 6th dressed up as Black Widow and just walked about. 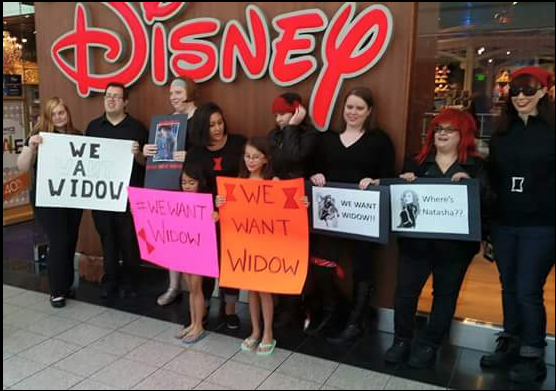 Some had signs, some people just posted pictures of their Black Widow cosplay to show their support. All included the tag #wewantwidow. The tag started because Black Widow doesn’t get the representation she deserves, especially in merchandise. How can I reenact my favorite part of Age of Ultron (when Widow jumps out of the plane on her bike) when all of the toys gave the bike to Iron Man or Captain America? And if I can’t do it, how can little girls who want a strong female character who has overcome adversity to find something she’s great at do it? It’s frustrating for everyone. Image courtesy of HeroicGirls on twitter. I didn’t participate because I don’t have anything Black Widow (and also because I was inside packing all day), but I want to be prepared for the next time this happens. I’m making myself a Black Widow skirt, and will be selling more on my etsy page (shameless plug here) as soon as I make a couple. The point is, Black Widow needs representation. We’ve been talking about it online for awhile now, and thanks to Kristin Reilly, Black Widow is coming to the streets. So how can we do our part if we’ve missed #wewantwidow? We can support her comics (especially the current run). Go to your local comic shop, or if you have to order online, go through Comixology; they make a big deal out of women in comics doing well. But try to go through your local shop; if they see that people are buying Widow, they’ll buy more of her comic from the distributor, and Marvel / Disney will have to take notice. You can also help by buying the Black Widow pieces from Her Universe’s team-up with Hot Topic. Buy the jacket or dress. And of course, but toys that include Natasha. There are a couple Pop! Vinyls from Funko. Grab one of those. Give the gift of Widow, tell your friends, get everyone involved. If you don’t have the money? That’s okay. Keep using the hashtag, keep Black Widow in the public eye as much as you can, because she deserves it, dammit. And all of her fans; young and old, deserve to have more of her to appreciate.